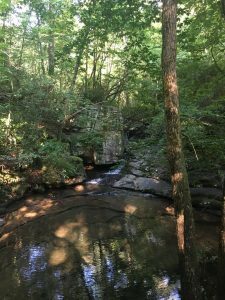 Continuing in the rustic tradition of the Civilian Conservation Corps (CCC), mountainous DeSoto State Park is nestled atop beautiful Lookout Mountain in scenic Northeast Alabama and accented by many rushing waterfalls and fragrant wildflowers that will simply take your breath away. Developed in the late 1930s, the hard-working and dedicated men of the CCC made many enhancements to the park that have withstood the test of time and will last for future generations. 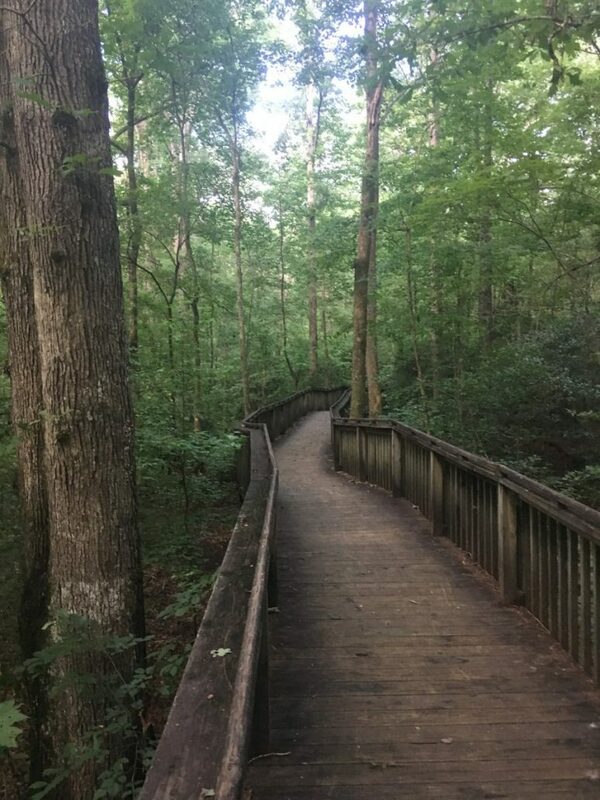 Come commune with Mother Nature as DeSoto State Park offers a family-friendly atmosphere that holds wonders for people of all ages! 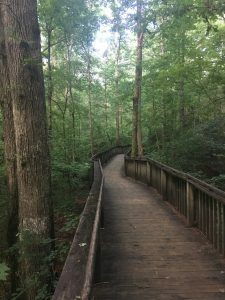 Whether a nature hobbyist, outdoor enthusiast, or sporting fanatic — DeSoto State Park has plenty to do to keep you pleasantly entertained. Kayaking, fishing, hiking, biking, cycling, rappelling, bouldering, picnicking, wildflower expeditions, and just plain ole’ exploring nature — we literally have it all! We cater to individuals, families, and small to large groups of all kinds. Judy and I arrived mid-afternoon and spent the night of July 18 on-site, departing late afternoon the next day. I encourage you to visit the website (better yet… visit the Park!) 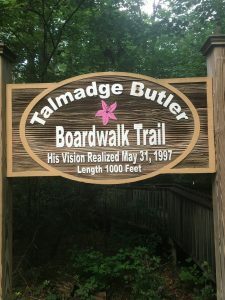 to see the features and sights that normally attract visitors: http://www.alapark.com/desoto-state-park. I’ll offer reflections on the segments in this Great Blue Heron Blog Post. We will build our next DeSoto visit to cover the falls and other larger-scale attractions that appear in the brochures. Finishing dinner after dark, we decided to leisurely walk the paved park road that led from the lodge/restaurant to the cabin cul-de-sac, a fifteen-minute round trip. We talked little, overwhelmed visually and auditorially, leaving no room for other than appreciation and awe. 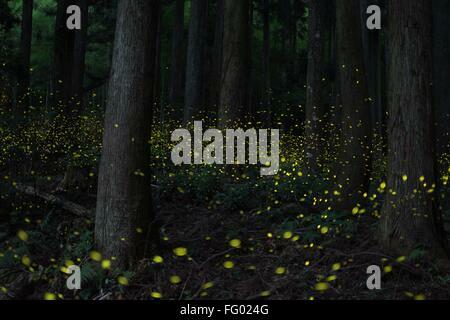 Fireflies brought the deep woods to life. I had left my iPhone (my camera) in our room to charge — I don’t think I could have captured the lightning bug light-show. Even the stock professional photo below does not do the spectacle justice. Add to the image the cacophonous green tree frog chorus and you might appreciate why we spoke little as we strolled. We considered the experience as a gift. Such gifts are available only to those willing to accept them. To those willing to look and see. For how many pre-human eons have such glories blessed these Appalachian woods? What Native American lore and legends tell the story of sight and sound we absorbed spiritually? What other DeSoto State Park magic awaits the visitor? I reveal the following with some trepidation. Perhaps you may think me crazy for such a habit. First, I set my alarm for 3:55 AM, wanting to be outside to welcome first light. Instead, I awoke a little after 3:00AM wired and ready for the day. 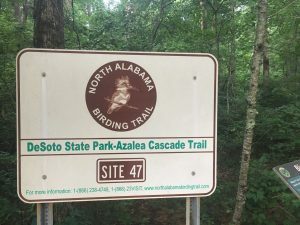 Hiking boots laced, flashlight in-hand, a trail map in my pocket, I briskly walked seven minutes in the no-moonlight darkness to the Boardwalk Trail, which extends a little less than a quarter-mile to Azalea Cascade. A few green tree frogs still sounded, but without the prior evening’s volume and fervor. I saw the entrance signs below only in my flashlight’s beam. I thought about inserting a photo of total darkness, yet decided that all of you can imagine such without assistance. I admit some level of disappointment that not once when I turned on the light did I see a pair of eyes reflected. No lions and tiger and bears! I’ve noticed many times before that nighttime woods draw focus to sounds. Beyond the frogs, I heard soft rustlings — a light breeze… a critter or two? 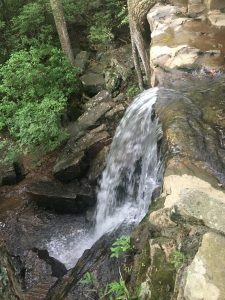 Water gurgling… a small cascade, growing louder as I proceeded along the boardwalk. Nighttime softens everything. Having walked pre-dawn, I more deeply appreciated the daytime reality! I returned to our room in time to join Judy for our dawn walk, retracing much of our firefly route. A different world, yet no less enjoyable seeing the woods emerge from darkness… wondering where the tree frogs had taken refuge for the day. 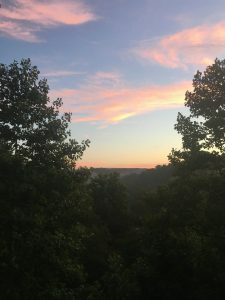 The sun kissed the cirrus to our east as we looked across the West Branch of Little River from our deck, listening to the rapids below. 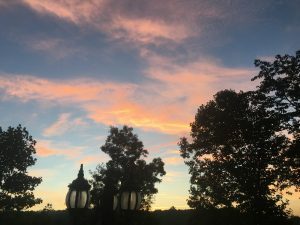 Amazingly, I have encountered far too many people who consider a summer sunrise something that happens before they awaken! DeSoto is a Park of falling and cascading waters. Here are two such features, two of many and incidental to my true focus as I hurried along that morning. I’ll devote another DeSoto hike on a subsequent visit to the Park’s infamous falls, rapids, and cascades. Instead, I paid little mind to the water and trees, which the forester Steve had trouble intentionally ignoring. 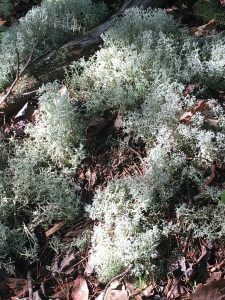 I know most of the mega-flora and many of the forest floor spring ephemerals. I am far less familiar with the non-flowering plants. I ask that you accompany me on the non-flowering plants museum tour below. Enjoy the images without expecting much in the way of identifying captions. 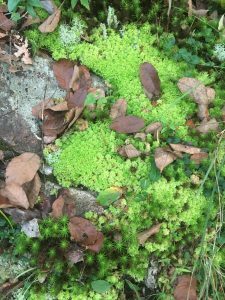 The non-flowering plants include: algae, fungi, lichens, mosses, liverworts, hornworts, ferns, and fern allies. 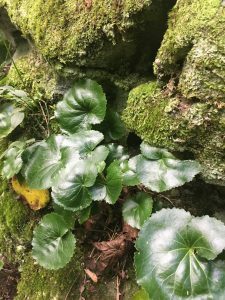 It’s a rich variety of such lesser plants that crowd every niche from tree bark to rock surfaces. I find it hard to match the grand majesty of a 110-foot oak, yet the beauty in the collection below challenges the grandeur of the forest rising above. Again, all this from a two-hour hike wedged between breakfast and my 9:30AM shower and change-of-clothes. I’m not sure that any of this incredible display is referenced in Park literature and brochures. 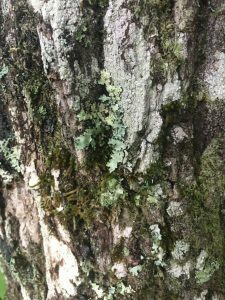 These colonies of algae, mosses, and lichens found perfect homes on a white oak (lower left) and a Virginia pine (lower right). 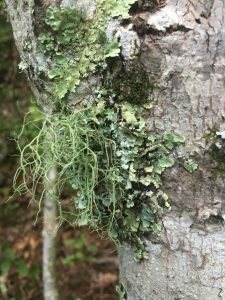 The filamentous beard lichen and its foliose cousin decorate the small sugar maple (lower left) and a delightful combination of lichen, moss, and algae graces the chestnut oak (lower right). 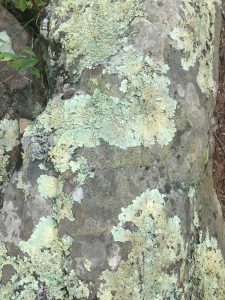 I suppose lichens have been flourishing on bare rock for far longer than early primates began standing on two legs. A few hundred million years longer! Our current human trajectory might suggest that they could very well outlast us by a similar period. 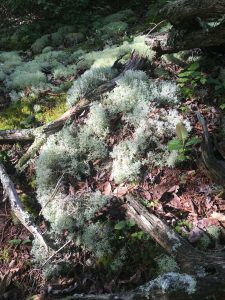 Lichens are not in the business of devising means of their own demise. They do not harbor dreams of empire and material consumption. Their primary beauty is simplicity… along with artist-quality colors, patterns, and processes. 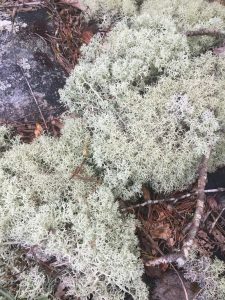 Although I have not ascertained whether I am correct, I’m guessing that coffee table style books of exquisite lichen photographs are available at Amazon. 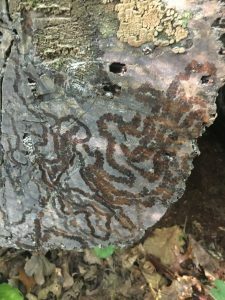 Okay, I couldn’t resist looking; Lichens of North America looks like a winner! 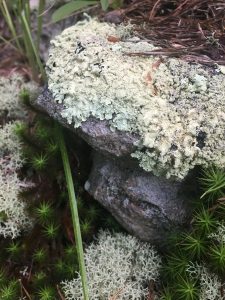 I also found the website for the British Lichen Society (promoting the study, enjoyment, and conservation of lichens), an organization offering many such books and manuals. Another piece of fine art caught my eye. Is it a grey algal film on this rock face? Was it a hungry snail or two that grazed the delicious coating, leaving intricate feeding patterns, careful not to cross its own path? My normal routine of tree-gazing would have missed this level of detail. I recall several decades ago what was then a fad — home terrariums with collections of flowering and non-flowering plants. The fad passed, yet Nature continues cultivating such collections on the DeSoto forest floor among the rocks. Lower left features at least two types of lichens and delicate mosses. Nature achieves by chance what the most ardent terrarium aficionado might create with deep labor and artistic flair. 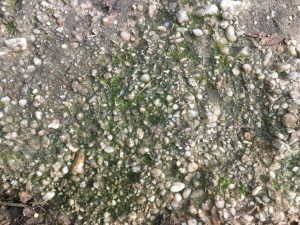 Limestone dominates DeSoto’s ledges and outcrops yet I found this conglomerate… itself a work of art — an algal pebble garden. I love our humid temperate climate. There are no vacuums for Nature to abhor when 55 inches of rain evenly distributes across the year. 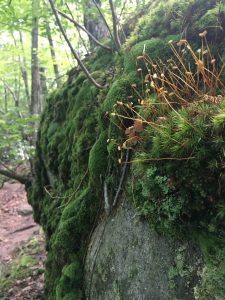 There is no such thing as bare rocks in these protected deep woods. 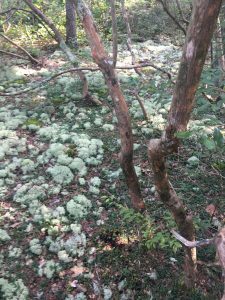 Mosses and lichens grow in profusion. I wonder what I might capture with a good camera… one capable (the camera and the operator) of much closer and more magnified views? 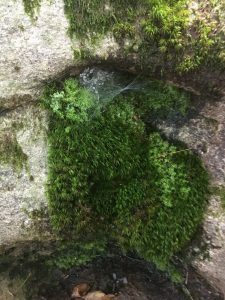 I like the spider home in the crevasse among the mosses lower right. Not such a spot of beauty and wonder for the hapless insect encountering the sticky web. My words cannot enhance the magic in these two forest floor images. These next four photos depict an unusual community perched on a broad terrace of very shallow soil atop limestone. 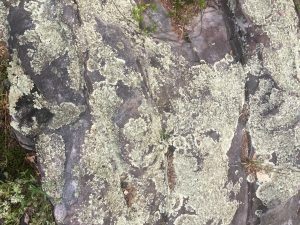 Thick lichen reminded me of northern Finland plant communities far above the Arctic Circle, ideal habitat for native reindeer… ungulates that subsist on lichens during the extended deep winters. No reindeer at DeSoto… nor the extended deep winters typical in the land of the midnight sun! That’s mountain laurel with the distinct gnarled stems and decorative bark (lower right). Allow me to divert briefly from the non-flowering plants. I couldn’t resist the glossy foliage of this rock-face-located beetleweed (Galax urceolata). Also terrarium-worthy! Nor could I pass up this gnarled chestnut oak seeming quite content at the ledge-edge. 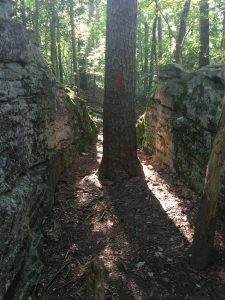 And how could I not snap this pine sentry guarding passage along the red-blazed trail? I felt like reaching for my photo-i.d. and boarding pass. Many wildlife enthusiasts are attracted to what I’ve heard dubbed the charismatic mega-fauna. Same holds for plant enthusiasts (charismatic mega-flora), this forester among them. 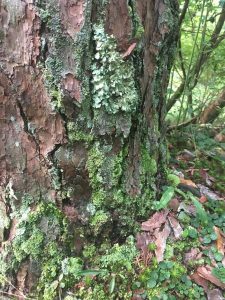 I’ve focused often in these Great Blue Heron Blog Posts on trees. Not this time. I decided ahead of this series of short hikes to direct my attention to a smaller scale. And what wonders emerged… ones I had not expected. 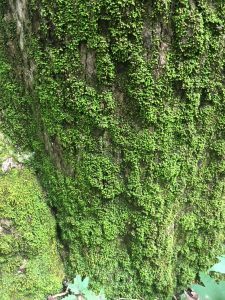 Were it not for spiders, small insectivorous mammals, birds, snakes, toads, and other such forest floor predators, I might have wished for a bit of personal shrinkage to place me among the lichen and moss forests. However, I’m content to view from my top-of-the-food-chain scale! I know that Nature’s beauty, magic, wonder, and awe exist at multiple scales. I believe that her lessons can inform, instruct, and inspire better and more rewarding living, learning, serving, and leading. And because I so believe, I can look with intention, see with understanding and appreciation, feel with deep emotion and spiritual awareness, and practice Earth stewardship in my own small corner of the world. 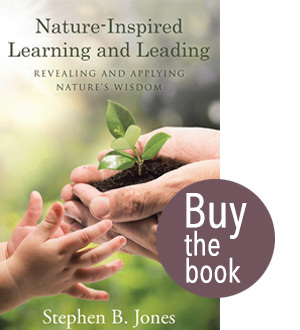 My focused look at non-flowering plants opened my mind and eyes. Even as a forester and doctoral-educated applied ecologist, I am struck by how little I know… and also by how much I don’t normally see. 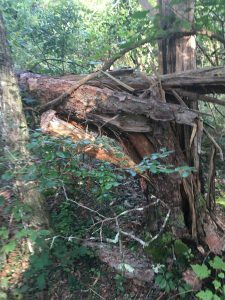 Had I been in tree-focused hiking mode, within my comfort and knowledge zone, think about what I would have missed. My take home lesson from these DeSoto strolls is that we too often choose selective blindness. We miss the museum nooks and crannies where special treats and exquisite art are displayed, yet seldom seen. Likewise, how many people choose not to avail themselves of our State Park gems. 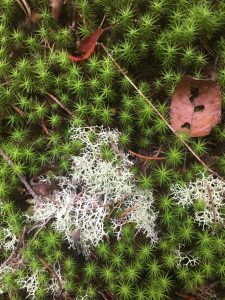 Who miss even the macro-attractions of scenic overviews, mighty oaks, and waterfalls… much less the micro-scale non-flowering plants? 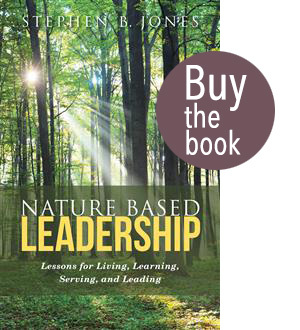 Nature rewards those who choose to accept her gifts of beauty, magic, wonder, and awe. Nothing is static in Nature. 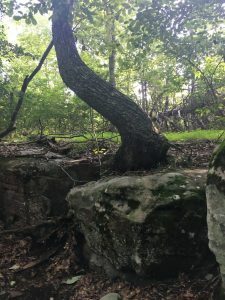 We’ll examine evidence of natural system death and renewal at DeSoto State Park.